Entering the Santa Monica History Museum for Shirley Temple: Santa Monica’s Biggest Little Star, visitors are greeted by a gift shop laden with lollipops, animal crackers, and the optimism of a simpler time. People with only a cursory knowledge of Temple’s work will appreciate artifacts — dresses, shoes, black-and-white images — from her time as the #1 box office star, from 1935 to 1938. But, for her more seasoned fans, there’s an abundance of insight into Temple’s life and career beyond the age of 12. 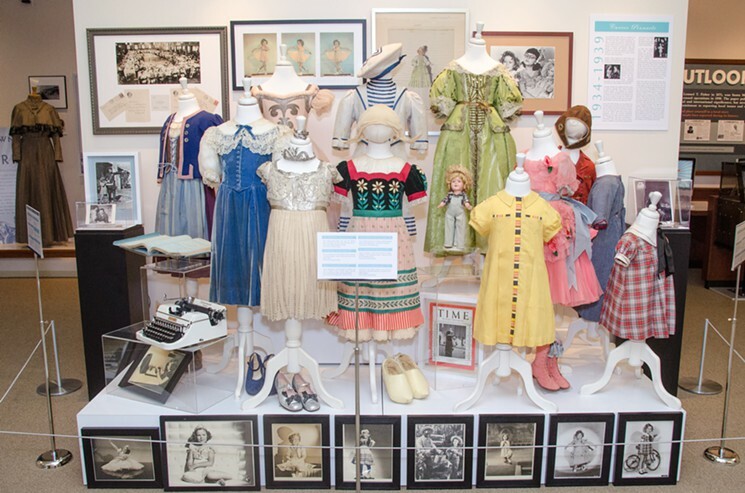 The museum celebrates Shirley Temple’s (right) time as a child star, it also provides a view of her as a more complete individual — tap-dancing moppet, mother, television series creator, businesswoman, and politician. Temple was born in Santa Monica, so it’s fitting that she be memorialized in a museum that seeks to preserve the city’s history. The museum previously hosted a Temple exhibit in 2015 that focused only on the actress’ early career. Temple’s mother, Gertrude, preserved all of her daughter’s belongings from a young age, which Temple continued to do as an adult, resulting in an extraordinary collection of items, 120 of which are on display here. Curator Sara Crown explains that though the museum was offered several hundred items from collectors and Temple’s family, it pared down with a desire to focus on items Temple had actually owned. The only exception is a case of Temple-inspired merchandise, including dolls created in her likeness. Temple was one of the first child stars to have lucrative merchandising — Temple and her family were innovative in their control of licensing her name. Temple’s birth certificate and receipt for doctor’s charges represent the most direct surviving connection between the actress and Santa Monica. For fans of Temple’s films, it’s fascinating to see the intricacies of some of her most famous costumes up close, from lambswool-lined wooden shoes from Heidi, to the polka dot dress that she wore in her breakout performance in Stand Up and Cheer! 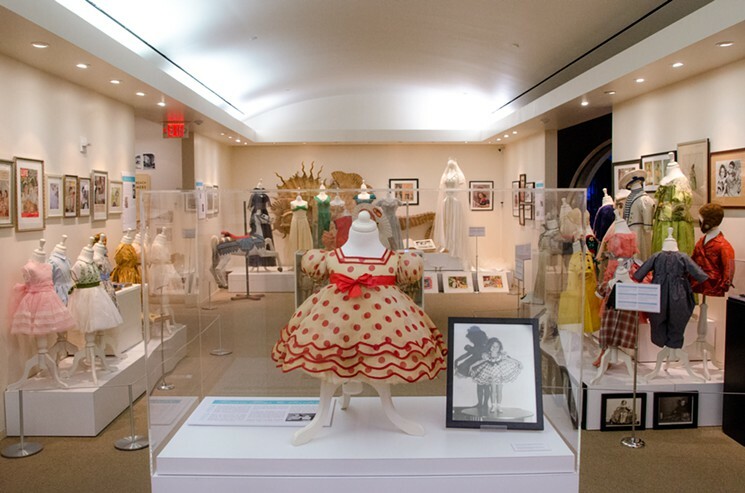 The exhibit also includes more personal tangible items, which give a beautiful glimpse of Temple beyond her juvenile persona, including an antique carousel horse Temple restored herself, and the stunning ivory-satin wedding gown from her first marriage to John Agar in 1945. 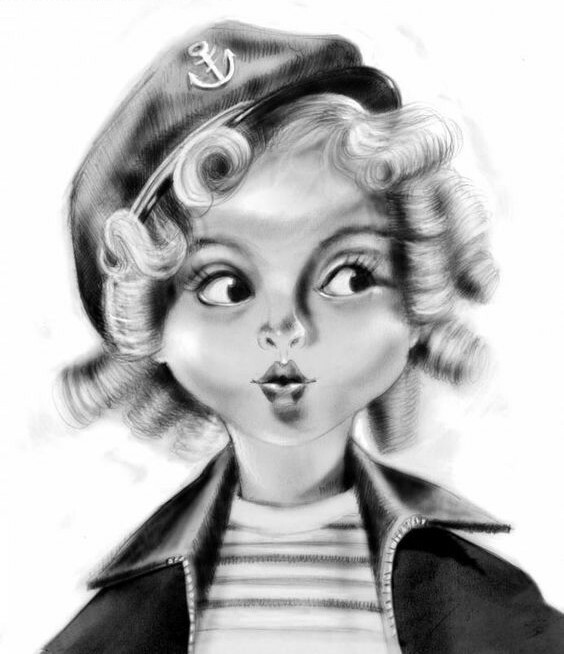 There is also a glimpse into lesser-known aspects of her career, including her films as a teenager, and her 1958 return to entertainment with the television series Shirley Temple’s Storybook. Temple was at the peak of her fame during some of the worst years of the Great Depression, leading President Roosevelt to praise her for her unique ability to lift the spirits of Americans. The exhibit showcases a collection of photos and letters from Franklin and Eleanor Roosevelt, thanking Temple following her visit to the White House. It reflects her unique role as a national symbol of hope and optimism during one of the nation’s darkest times. Temple also broke racial barriers, as the first to be part of an onscreen interracial performance opposite Bill Bojangles Robinson in The Little Colonel and several subsequent films. A pink dress from that film highlights the groundbreaking moment. From a young age, Temple used her image and fame to promote important causes, taking an active role in War Bond drives and visiting soldiers as a teenager during World War II. Even after retiring from acting at 22, Temple actively participated in charity work and civic engagement, ultimately devoting the last four decades of her life to public service. The exhibit highlights this aspect of her career, including materials from her unsuccessful 1967 run for Congress, and photographs and clippings from her years as a representative to the UN General Assembly and her service as the United States Ambassador to both Ghana and Czechoslovakia. She also brought attention to issues closer to home following her diagnosis with breast cancer in 1972. At the time, this was a private battle for public figures; Temple was one of the first to publicly discuss her experiences fighting the disease, and promote open conversation around women’s health issues. The exhibit features the 1973 issue of Lady’s Journal that includes the honest, pioneering interview. The Santa Monica History Museum is at 1350 7th St. in Santa Monica; and runs through July 1st. This entry was posted on Friday, June 10th, 2016 at 12:02 am	and is filed under Blog by Manny Pacheco. You can follow any comments to this post through the RSS 2.0 feed. Responses are currently closed, but you can trackback from your own site.